Did you know that on GiveGab, your fundraising campaigns, events, and giving day profiles all have a built-in Fundraiser leaderboard? Use that to your fundraising advantage and spark some friendly competition between your fundraisers! Motivating your fundraisers can be as simple as holding a contest to incite some friendly competition or sending regular updates on your campaign progress. You can also host kick off parties or closing events to thank your fundraisers for their support. Below, you will find a few ideas that we have seen among the most successful P2P fundraising campaigns on GiveGab! 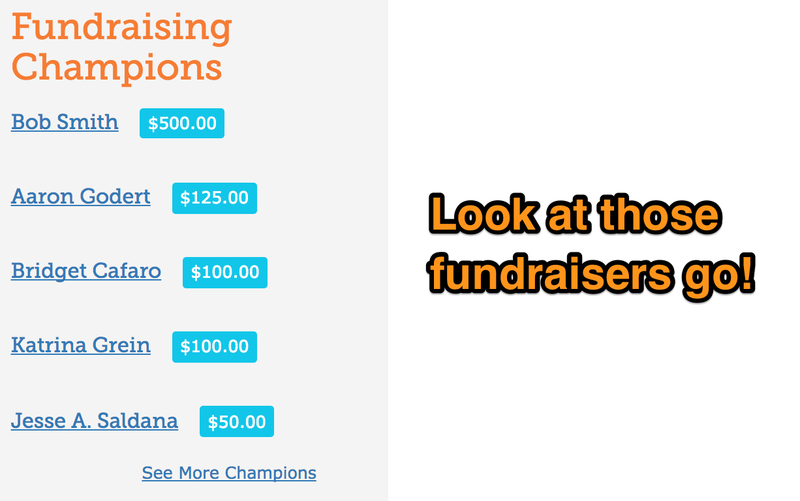 A fundraising champion party is a great way to kick-off a peer-to-peer fundraising campaign. Kick off parties create wonderful opportunities to introduce your Peer-to-Peer Fundraisers and create a sense of community, collaboration, and celebration. They can also be a fun way to teach your supporters everything they need to know to become fabulous fundraisers. If your peer-to-peer fundraising opportunity is for an event that you are hosting in your community, having a closing party is also a great way to celebrate their hard work and to reward the fundraisers who really stood out in their fundraising efforts! Consider offering food, drinks, games, and other networking opportunities to bring your fundraisers together and show them that they truly are the most important part of your organization's mission. Want more information about how to host an awesome fundraising party? Check out this awesome blog post on How to Host a Fundraising Champion Party! Before your Peer-to-Peer fundraising campaign kicks off, try to have 1-2 prizes in mind and then start setting up the guidelines and rules for your prizes. The more you understand the rules and regulations you want to put in place for your prizes, the more you will help your Fundraising Champions to understand them as well. After you have the prizes and rules in mind you can start to strategize about how you want to get your fundraisers involved and engaged. This might mean sending out messages on social media or email as soon as you decide which prizes you will offer. If you are having a closing party that would be the perfect time to celebrate your top fundraisers by rewarding them with their prizes! Wanting to learn more? Check out this blog post on Utilizing Giving Day Prizes! You can post status updates to all of your participants and Fundraising Champions through your Admin Dashboard. Status Updates are a great way to keep your Donors and Fundraising Champions up-to-date with your campaign's progress and your organization's goals. Ready to learn more? Check out how you and your Fundraising Champions can use the Peer-to-Peer Fundraising Champion's Toolkit here!